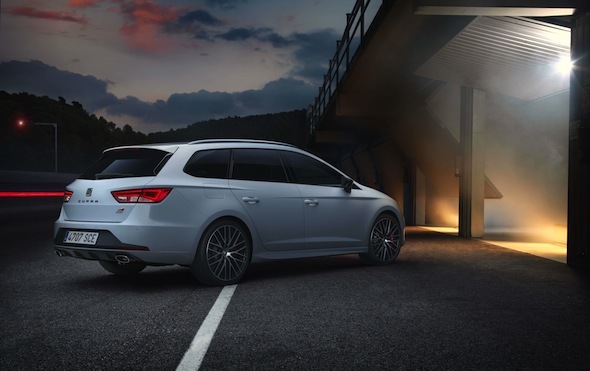 This is the Seat Leon ST Cupra 280, the first ever performance estate from the Spanish carmaker. Joining the Cupra hatchback and Cupra SC coupe at the very top of the Leon model range, the ST offers the same performance allure, but with the added practicality of a much larger boot. At 587 litres, the rear load space is some 207 litres larger than the already commodious hatchback, despite being only 27cm longer. Fold the rear seats flat and space swells to 1,470 litres. Under the bonnet the ST Cupra is fitted solely with the 276bhp version of the 2.0-litre turbocharged engine fitted to the hatchback (though that car is also available in lesser 256bhp guise). Power is sent to the front wheels via a six-speed manual gearbox and limited-slip differential, with a six-speed twin-clutch automatic 'box available as an option. The additional bodywork hasn't unduly harmed performance, with the ST able to cover the benchmark 0-62mph sprint in 6.0 seconds – just 0.2 seconds slower than the hatchback. Despite the prodigious performance on tap, Seat claims the ST Cupra will return 42.8mpg on the combined cycle, while emitting 154g/km of CO2. On top of an impressive standard kit list, which includes 19-inch alloys, full LED headlamps and a 5.8-inch colour touchscreen, buyers will also be able to specify the 'Sub8 Performance Pack'. For £2,025 this sees the model further endowed with larger performance brakes, unique painted alloy wheels (in either orange or black) and side skirts for a more ground-hugging profile. 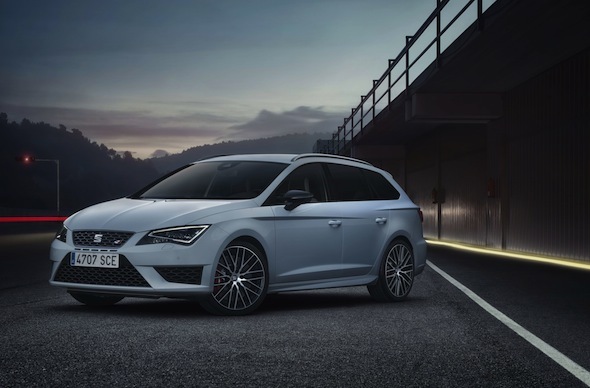 Price and specification details for the Seat Leon ST Cupra will be announced closer to its launch in March. It is expected to carry around a £1,000 premium over the standard five-door Cupra 280, which starts at £27,510.